On a cool, crisp, sunny day, a friend and I travel to Williston, Florida for my first exploration of the well-known Blue Grotto dive. Williston is somewhat of a diving mecca, as it is also home to Devil's Den, one of the most spectacular geological features I have ever seen. 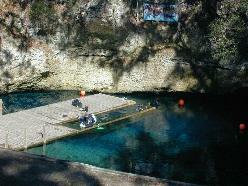 Blue Grotto has been open since 1988 as a commercial dive park. It is a large sinkhole with steep limestone walls surrounding it (see photo to right). Entry into the sinkhole is extremely easy due to the floating wood dock design, which features lots of surface area to get geared up, and a gently sloping ramp into the water. The opening of the sinkhole cavern is enormous-80 feet by 20 feet. Because the water temperature is 72 degrees year round, it feels like bathwater on this somewhat chilly January day. Since they are allowed for divers not cave-certified, I bring along a dive light, and find it useful for peering into the many caverns, crevasses, and holes within the sinkhole. The sinkhole is famous for always having crystal clear water, delivered from a spring that discharges 22 million gallons of sparkling clean water each day. We are not disappointed, as we have visibility of about 100 feet during our one-hour dive. Looking back toward the cavern opening when we are down to the first cavern room is an impressive sight, since the cavern angles downward and creates a view of strong, striking streams of sunlight filtering down toward you. The sinkhole contains a school of smallish fish-many of which are catfish. For those that are cave-certified, there is a nylon rope that leads you through a "U"-shaped cavern down to a depth of 95 to 100 feet. You enter from one side of the cavern and exit from another side, which means you do not need to backtrack. Peering down toward this cave route, we are sorely tempted to dive down to swim the route. We settle for doing a few fairly pleasant, somewhat tight "swim throughs" at about 50 to 60 feet. One interesting feature of Blue Grotto is an "air bell" at about 30 feet. This allows divers to breath compressed air while still at depth, should there be an out-of-air emergency. We check it out, and it holds several divers at one time. The park area surrounding the sink is a quiet, pleasant, wooded area with picnic tables mostly used to gear up. There is a dive shop, restrooms, and a place to rinse off gear.